What is the Williams Parents Fund? An essential part of a 200-year-old annual fundraising effort to help cover the complete cost of a Williams education. All Williams students benefit from the generosity of alumni and parents. Williams’ tuition, although substantial, covers only a part of the more than $90,000 investment Williams makes in the education of each student. Between October and May, all parents are invited – through mailings, emails, and phone calls from fellow parents – to make gifts to the Parents Fund. Who runs the Parents Fund? 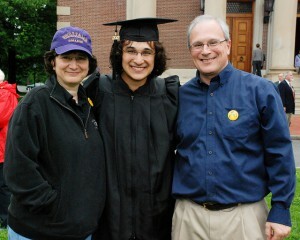 The Parents Fund Committee is comprised of about 70 families whose children are Williams undergraduates or alumni. These volunteers are supported by the Parents Fund staff. The Committee’s primary focus is to support the highest priorities of the College. If you’d like to volunteer, please give us a call at 413.597.4357.
Who gives to the Fund? Each year, roughly 1500 parents participate in the Parents Fund. They gave $2.15 million to the 2016 Parents Fund, with the largest gift of $380,000 and a median gift of $183. Every Williams family and student benefits from the Parents Fund, and each gift supports the extraordinary education available to all Ephs. Donations signal to foundations, alumni, and other parents that Williams deserves their support as well. Parents Fund dollars together with gifts from alumni and significant monies from the endowment, make it possible for Williams to offer an outstanding education. Will my gift truly make a difference? Absolutely! The Fund is a collection of hundreds of gifts. Last year, 85% of our gifts were for $500 and less. Together our gifts make a significant and important impact on the quality of academic, student, and residential life. Participation is the cornerstone of the Parents Fund and the College. How might my gift be used? Williams’ Highest Priorities – providing the college with resources that can be used immediately wherever they are needed most. Gifts not designated for one of the other purposes are used here. Financial Aid – enabling Williams to create a community of enormously talented, widely representative young people whose ultimate impact on society is incalculable. Academic Excellence – supporting Williams’ educational heart-the relationship between students and professors. Student Life – fostering more than 100 student organizations, intramural and club sports, the Williams Outing Club, summer work internships, great performances, and so much more. Equity and Inclusion – nourish initiatives that contribute to an intellectual environment where all can live, learn, and thrive. Sustainability – supporting reduction of the college’s carbon footprint while teaching today’s Ephs to build a more sustainable future. The Arts – affirming the role of the arts and supporting open, creative, and flexible learning opportunities both in and out of the classroom. Athletics – sustaining student-athletes and gifted coaches in Williams’ legendary intercollegiate program. Donors may further direct their gift to show support for individual varsity sports. By designating a purpose for their gifts, families can show Williams what they care most about, but budget appropriations for departments and programs are not directly affected by individual gifts. Williams gratefully accepts checks, credit card gifts, and securities. For your convenience, each Parents Fund mailing includes a postage-paid gift envelope. Credit card gifts can also be made online at either http://give2.williams.edu or http://give2sports.williams.edu or by calling the Parents Fund office at 413.597.4357. How else can I get involved with Williams? Volunteer to work on the Parents Fund Committee!